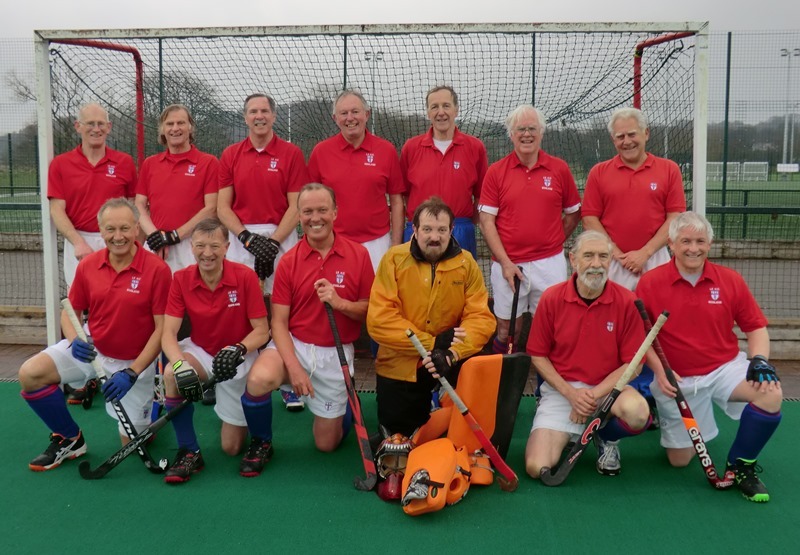 LX Red Over 65’s v. Scotland Thistles at Durham University on March 27th 2014. This game was played against the same Thistles side that had drawn their game the previous day against England SGMs. The Thistles side consisted of a mixture of Over 65’s and Over 70’s, which probably gave them a slight advantage against the SGMs, but a slight disadvantage against LX Red Over 65’s. The fine weather that greeted us on our arrival that Thursday morning soon disappeared, to be replaced with a cool easterly wind and some very uncomfortable rain. It was Durham after all! Fortunately our hearts were warmed by a confident opening which saw Brian Hopkins striking a super goal, within two minutes of the start, following a short corner rebound. The Scots were visibly stunned by this and tightened up their defence as LX sought to make inroads down both flanks. Other chances were created but luck, and the wind and the rain were against us. In the second quarter LX found a purple patch; passing was crisp and accurate, players were supportive in all areas of the pitch and we were rewarded with a flurry of goals that produced a 7-0 score line at half time. In the third quarter LX took their collective foot off the pedal; passes went astray and the midfield had to work harder to maintain possession. In the fourth quarter, however, LX reasserted themselves and using a variety of ‘long’ balls and short passing created 3 further goals. The Thistles gained a consolation goal from a well struck short corner. Final score 10-1 win. This was the second of our warm up games (having previously beaten a Wales O65 side) as we approached the World Cup Tournament Trophy in The Hague……and although they both ended in convincing victories…..they did give us valuable time together to forge those essential links between the backs, midfield and forwards. As you will read later, the following day, these skills were really put to the test. For the record the scorers were Brian (Haveago) Hopkins 3, Bill (Poacher) Pickersgill 3, Dave (Terrier) Thompson 2, Roger (Glider) Girling 1, and Alastair (Robber) Robertson (1). A good dinner was enjoyed at The Marriott Royal County Hotel in Durham City. Having spent the night in hotel rooms more akin to a Chinese laundry in downtown Shanghai, in manly attempts to dry out kit from the previous day’s exposure to the elements, the squad awoke to yet more rain. Cap'n Ewing proclaimed the news they had been waiting for. The North had been asked to provide a strong and younger opposition! By the time the party left the hotel, there was not a banana left in sight in the breakfast room! By push back time, the squad was reduced to 11 fit, upright specimens, Messrs Pickersgill and Harris having suffered damage to their finely honed physiques in the previous day's exertions. It was clear from the off that the North had heeded Cap'n Ewing's request. This was going to be a tough match with a lot more defensive responsibility than the previous day's adventure. The North were retaining possession and moving the ball well but gradually LX were getting to grips with the game and the match was swinging like a pendulum from end to end without any clear cut chances falling to either side. John Ridings was working feverishly at the heart of the LX defence and Norman Ballard was a model of calm consistency at left half. Geoff Birkett had the right of our defence under control and if anything broke through that lot, Dave Ewing was there to sweep up. Behind them, Eric Best dealt most competently with anything that did threaten. As the midfield three of Roger Girling , Jim Tranter and Alastair Robertson imposed themselves more on the game, opportunities presented themselves for the front running Brian Hopkins, Dave Thompson and Roger Lomas and indeed only a couple of good saves and near misses kept us from scoring. The North were throwing an extra man forward and following a short corner that paid off, when, free on the top of the circle, that man cracked home a fine shot. Half time came with no further scoring but with LX still in determined mood. Denied a short corner, LX frowns were soon changed to smiles as a bizarre own goal brought the scores level. Taking the 16 yard hit, the defender passed the ball back to where he thought his colleague was, only to find that he wasn't and the ball rolled beautifully on to the back boards for a score of 1-1. Both teams were still going all out but the deciding goal came direct from a short corner. So, although a 2-1 defeat was suffered, this was a very good workout. The players now know each other better and with two months to improve fitness levels and with hopefully another get together in the offing, the signs are good for the forthcoming assault at The Hague. Thanks go to Mick Christopher [a new LXer] and Andy Holden for organising the opposition teams, accommodation, pitch hire and after match meals for LX Reds Over 65s. Squad. Back row l to r: Mike Harris, Brian Hopkins, Alastair Robertson, David Ewing [Capt] Bill Pickersgill, Jim Tranter, and Roger Lomas. Front row: Roger Girling, John Ridings, Geoff Birkett, Eric Best, Norman Ballard, David Thompson.